Having concluded postings on St Paul's Jewish and Hellenistic background, I would like to move on to a NT letter that comes from a different corpus, the Catholic Epistles - the First letter of St Peter. This letter is a powerfully moving and encouraging letter to the early Christians to stand firm in the grace of God as they encounter diverse problems and issues in a world that seems increasingly alienating. 1 Peter is addressed to ‘visiting strangers’ (1:1), ‘resident aliens’ (2:11), terms that indicate the precarious condition of Christians in the pagan world. They were mainly of pagan origin (cf. 1:14, 18; 2:9, 10; 4:3-4), probably recently converted (cf. 1:14; 2:2; 4:12), and in danger of giving up the Christian faith in the face of pagan hostility. There is no indication of an official state persecution: the letter counsels respect for government and emperor (2:13-17). By recalling the greatness of their vocation and by showing that persecution is a sign of their calling, the writer encourages and exhorts his readers to stand firm (5:12). Those who are regarded by the world as aliens and strangers have found a home in the Christian community. 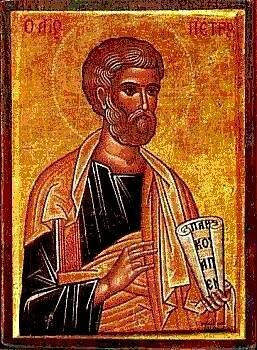 The Christians for whom Peter was writing were basically converts. Living in society as a minority, there was a tendency to fall back into the religion and culture of their surrounding environment. The letter will exhort them to witness through their Christian way of life. If they are faithful to this Christian witness, they will not be spared suffering and persecution. But the letter encourages them by insisting that they share in the suffering of Christ. The expressed aim of 1 Peter was to encourage its suffering readers to stand fast in the grace of God (5:12). Its literary, theological and social strategy was to set the issue of Christian suffering within the context of the tension between the readers’ social estrangement and their divine vocation, their ‘homelessness’ in society and their ‘at-homeness’ in the family of God. To counteract the divisive and erosive effect of innocent suffering upon the confidence, cohesion, and commitment of the brotherhood and its mission, the letter reassures its readers of their distinctive communal identity as God’s favoured family, encourages winsome conduct among the gentiles along with love within the brotherhood, and urges continued trust in God who vindicates the faithful who share the suffering and glory of their exalted Lord. One of the most notable features of 1 Peter is the identification of its addressees by a pair of Greek terms best rendered as ‘visiting strangers’ (parepidemoi – 1:1; 2:11) and ‘resident aliens’ (paroikoi, 2:11; cf. paroikia, 1:17). In the Greco-Roman world of 1 Peter, paroikoi and parepidemoi were regarded and treated as permanent or temporary ‘strangers in a strange land.’ Literally, ‘parokoi’ were foreigners who lived alongside (par-) the ‘home’ (oikos) of others. This conditions of geographical and social displacement was the constant and typical lot of God’s ancient people. Resident aliens formed a specific social stratum of local populaces (ranked below full citizens and above complete foreigners (xenoi) and slaves). Their cooperation or noncooperation with the native population could result in their moving up or down the social ladder. Legally, such aliens were restricted in regard to whom they could marry, the holding of land and succession of property, voting and participation in certain associations and were subjected to higher taxes and severer forms of civil punishment. Set apart from their host society by their lack of local roots, their ethnic origin, language, culture, and political or religious loyalties, such strangers were commonly viewed as threats to established order and native well-being. Constant exposure to local fear and suspicion, ignorant slander, discrimination and manipulation was the regular lot of these social outsiders. Because of their marginal status as outsiders, they frequently joined clubs or cults which offered the promise of social acceptance, mutual support, or even salvation. Strangers who had embraced the Christian faith for the communion, hope and salvation it promised were discovering that membership in this sect provided no escape from the prejudices and animosities of the larger society. To the contrary, membership in this strange and exclusive movement resulted only in an increase in social friction and suspicion of strangers now banded together in a missionising movement. As Israel’s history indicated, a social alienation and oppression had been the regular experience of God’s chosen and estranged people. From this history, 1 Peter drew on models and memories of dispersion and gathering, suffering and deliverance, societal rejection and divine acceptance so that continuity with the past, along with the faith of the present, might serve as an effective basis for hope in the future. What about us Christians? What is our relationship with the larger society and the world? This letter is addressed to “those who live as strangers” (1:1-2) – they are strangers by virtue of their unique Christian vocation in a pagan society. ‘Strangers’ but yet chosen (1:2). There is a Trinitarian dimension to this election: “chosen in the foresight of God the Father, to be made holy by the Spirit, obedient to Jesus and sprinkled with his blood.” The elect are consecrated by the Holy Spirit for a purpose – ‘obedience’ to Jesus, the Jesus who has resealed the new covenant with his own blood (this also points to the persecution which the Christians will experience). The emphasis is on the person of ‘Jesus’ and not just ‘Jesus Christ’ – Jesus = God saves. And it is only by the mercy of God (the gratuitous gift) that these strangers/aliens have become the elect and the holy people of God, the household of faith/ God. In 2:9, we see them described as a chosen race (a covenanted people) and a kingdom of priests (mediating god’s reality in the world through their ‘witness’ or martyrdom). At the outset of the letter (1:1-2:10), a rich array of terms, images, and contrasts serve to underscore the dignity and distinctiveness of the community to which the readers belonged. The letter wishes to bring home to its readers what is the ‘grace’ into which they have come by their conversion. This new situation, graphically described as a transition from darkness to light, rests upon God’s election, mercy and calling (1:2-2:10). Elected by God (1:1), sanctified by the Spirit (1:2; cf. 1:22), redeemed by Christ’s blood (1:18-19), believers in Jesus Christ, God’s elect agent of salvation, belong to the elect and holy covenant people of God, the household in which the Spirit resides (2:4-10). In contrast to Jews (1:4, 10-12), pagans (1:18), and all who reject Jesus as the Christ (2:4-8), those believing the enduring good news (1:23-25) have a permanent inheritance, a sure salvation, and a firm basis of hope (1:3-5, 13,21). Reborn by God the Father (1:3, 23; 2:2), believers as his obedient children are not to conform to the passion of their former ignorance but to the holiness of the Wholly other in the time of their alien residence (1:14-17). Through sincere love of brothers and sisters in the faith and avoidance of divisive behaviour, they are to maintain the solidarity of the brotherhood (1:22; 2:1; 3:8; 4:8). Throughout ancient society the household or family was considered the fundamental form and model of social, political and religious organization. The strategy of 1 Peter was to mobilize the resources of faith and concerted action which would enable the Christian addressees to stand firm and persevere as the community of God in a society from which they are estranged. Basic to this strategy, as the stress upon solidarity in suffering illustrates, was an emphasis upon the distinctive collective identity and responsibility of the believers.Although the term ‘church’ (ekklesia) is never employed, in the broader theological sense 1 Peter is one of the most church-oriented compositions in the New Testament. In society, Christians are indeed strangers and strangers they should remain, as signs of holiness and beacons of hope. Endurance of suffering and steadfastness in faith is possible because of their incorporation in the household of God. In the family God the faithful the homeless of society (paroikoi) have a home (oikos) with God. The church, according to 1 Peter, is a home for the homeless.